We design pickling Tanks that are used by galvanizing plants manufacturers for usage in high tension transmission Tower, Poles, Pipe Cable Trays, Grating, Guard Rails, Railing and other Fabricated items. 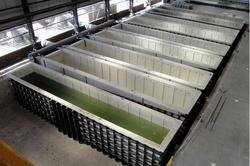 We manufacture using the best processes and technology, our pickling tanks are thoroughly tested for their usage in rough conditions as well and has almost 8 years of service life. Pickling tank are fabricated from Poly Propylene plastic sheets from 20 mm thk to 40 mm thk With outer casing made of steel lined with FRP. 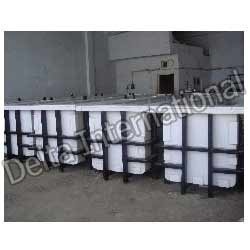 These pickling tank are used for degreasing and acid cleaning of parts In the galvanizing process or other plating industries.